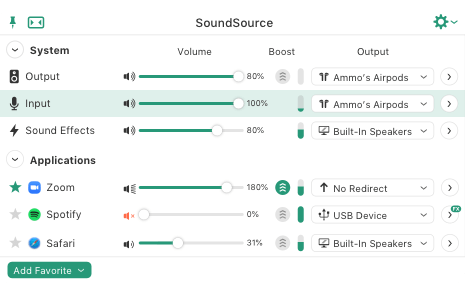 Rogue Amoeba | SoundSource: What's New in Version 4! Never used SoundSource? Check out the main page! SoundSource 4 takes audio control to a whole new level. The fast access to audio device settings you expect from SoundSource is now joined by powerful per-application features, including volume adjustment, output routing, and audio effects. Read this page to learn about what's new in the latest version. If you own a license for SoundSource 3, you're eligible for a discounted upgrade to SoundSource 4. The single biggest addition to SoundSource 4 is its ability to control audio on a per-app level. Free yourself from the coarse controls MacOS offers, and control and adjust the audio from any application playing on your Mac. App-specific volume controls let you set one app louder than others, or just mute an annoying app entirely. You can also use the per-app output controls to send audio to different outputs, so your music plays through one set of speakers and other apps go to a secondary device. You can even configure specific applications to have their audio adjusted by a 10-band equalizer and more. Start enhancing your audio with a single click of the Magic Boost button. For more control, use our renowned 10-band Lagutin equalizer to improve the quality of any audio on your Mac, with presets will help you bump up the bass, improve the performance of small laptop speakers, and more. You can adjust audio from a specific app, or all audio playing to your system's output device. Once configured, SoundSource will run without you needing to do anything but bask in the bliss of great-sounding audio. Audiophiles will also be thrilled, with support for applying Audio Unit plugins to any audio. Get advanced audio adjustment with MacOS's built-in collection of Audio Units, or load in your own third-party Audio Units. SoundSource has always provided instant access to the basic settings for your Mac's audio devices. Now, it offers much more beyond device selection for your System's Output, Input, and Sound Effects devices. With SoundSource 4, you can control everything related to your Mac's audio devices, right from your menu bar. Adjust volumes for your speakers and other outputs. Configure the input level for your microphone or other input. You can even tweak the balance and sample rates. You might never open the Sound System Preference again. HDMI devices, DisplayPort monitors, and many other audio outputs fail to support the volume keys found on Mac keyboards. SoundSource makes those keys work with any outputs you have! When you find the perfect settings for SoundSource's built-in 10-band Lagutin equalizer, you can save it for future use. SoundSource's volume controls let you get the perfect mix, by adjusting both audio devices and volume levels for individual applications. With the configurable global keyboard shortcut, you can pull SoundSource forward right from your keyboard. If you want to keep SoundSource visible at all times, you can pin it to your screen, to make it float above everything else. We made SoundSource fully accessible with Apple’s VoiceOver, so users who are visually impaired can get the most from their audio. Unfortunately, the play-thru functionality which was part of SoundSource 3 did not fit the vision we have for SoundSource 4 and beyond. As a result, the Play-Thru window has been removed from SoundSource 4. We now recommend using Audio Hijack for play-thru functionality. Upgrade to SoundSource 4 Now! Download the free trial of SoundSource 4 to check out everything that's new. When you’re ready, click below to purchase your discounted upgrade to SoundSource 4! SoundSource is headed to your Downloads folder!